When goats are losing their hair or have just undergone surgery, keeping them warm is a top priority. A goat blanket thrown over the goat's head and secured underneath its belly keeps the goat warm while still allowing it to move. A properly secured goat blanket stays on the goat comfortably without restricting its movements. Measure the goat from the base of its neck to the base of its tail. Measure the goat from the top of its shoulders down to where its legs begin. Cut a rectangle out of polar fleece using the measurements that you have just acquired. Fold the polar fleece in half, lengthwise. Designate one short end as the front, which will fit against the goat's chest. Cut a V from the midpoint of the front to a point that is between 4 and 8 inches down the center of the fold. You are essentially creating a notch for the goat's head. Be careful when you cut, and remember that while you can make a cut larger, it is more difficult to make it smaller. Sew up the front of the goat's blanket. This leaves a hole for the goat's head to fit through. Cut four strips of polar fleece that are 1 inch wide and 2 feet long. Slip the coat over the head of the goat, inside out, with the seam of the front facing outward. 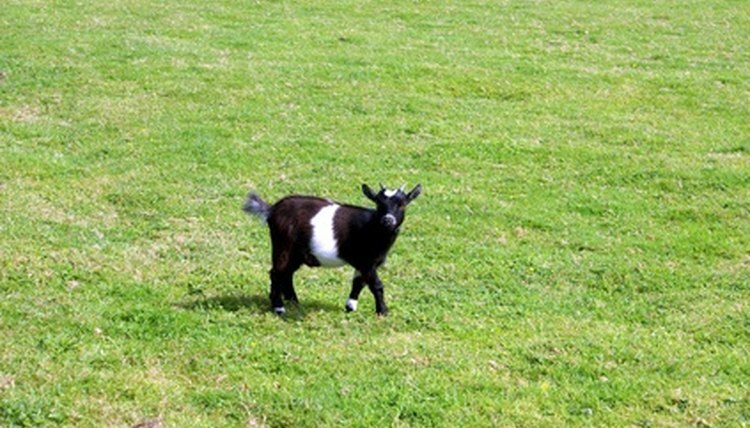 Mark the two spots directly behind the goat's forelegs, about halfway up the goat's body, using a permanent marker. Mark the two spots directly in front of the goat's hindlegs, about halfway up the goat's body. Remove the blanket from the goat. Sew one strip to each marker spot on the blanket. You can use these strips to tie the blanket to the goat. You can replace the tie strips with a broad belly band that is sewn down on one side and secured along the other with hook and loop strips.